In this job every so often things fall into place that allow you to do cool things on the cheap. Today was one of those days. My last flight got into PVD at 1:00pm which is much earlier than usual and left plenty of time for an excursion. The weather was forecast to be nice so I lined up a rental car and hit the ground running. When I was at WIA one of the seminars I took was “Early American Furniture: Anatomy of a Masterpiece” with Jeffrey Greene. Well, it turns out that Jeffrey Greenes retail shop The Ball and Claw is in downtown Newport, so naturally that had to be the first stop. I should add that while I was at WIA I talked to Jeff about stopping by to see his shop if/when I got a chance to go to Newport and he said “Sure, just give me a call before you come out.” Unfortunately I had no idea it would be this soon and I forgot to get his contact info. I explained the situation to the kind lady at his retail establishment, but she said she had no way to get a hold of him. I guess that just means I’ll have to make another trip to Newport to see his working shop at some point in the future. After having listened to Jeff’s lecture I was eager to examine his masterpieces. I was not disappointed. Here are a few quick quotes from his pamphlet in the store “His expertise is in creating historically accurate replicas of important original pieces in museums and private collections.” and “Greene has been authorized exclusively to replicate furniture in the collections of : The Newport Historical Society (which now owns all the historic mansions in Newport), The Rhode Island Historical Society and The Newport Restoration Foundation.” The first piece that really caught my eye was a Highboy. I’ve been studying furniture design and construction for years, but this was the first time that I’d been able to truly examine a period replica that I knew had been made true to the original in every way. The craftsmanship was amazing. Knowing that Jeff works in his shop alone and builds these pieces with period tools and techniques makes it even more amazing to me. I picked up Jeff’s book American Furniture of the 18th Century: History, Technique, Structure at WIA, but I’ve only made it through chapter one so far.Most of the construction was exactly as I expected base on my previous readings. The one detail that stood out to me was the drawer construction. The drawers were all dovetailed with half blinds at the front and throughs at the back as you would expect and the bottoms were solid raised panels, but it appeared to me that the raised panel drawer bottoms actually came all the way through the drawer sides (I can’t believe I didn’t get a picture of this!). Kind of like a really wide through tenon – looking at the end grain of the drawer bottom panel (about 3/16’s thick there) with about 1/2″ of draw side below that – the drawer sides appeared to be about 1/2″ thick as well. That was something I’ve never seen before. It would seem as though this setup would significantly weaken the drawer side unless the whole thing was glued up, but it would be a cross-grain glue joint as well. I don’t know. I’ll have to look it up in the book when I get home for sure! 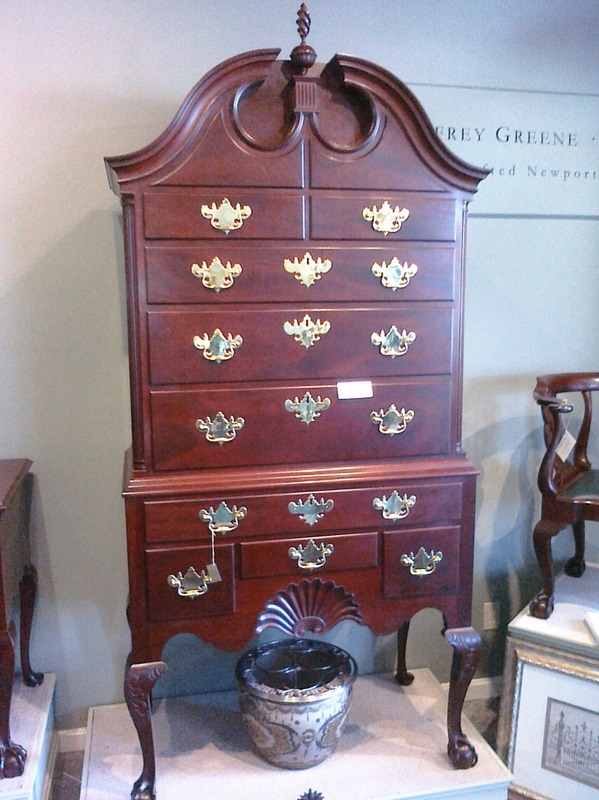 The second piece I gravitated to was a Tiger Maple Flat-top Highboy. I love this piece! 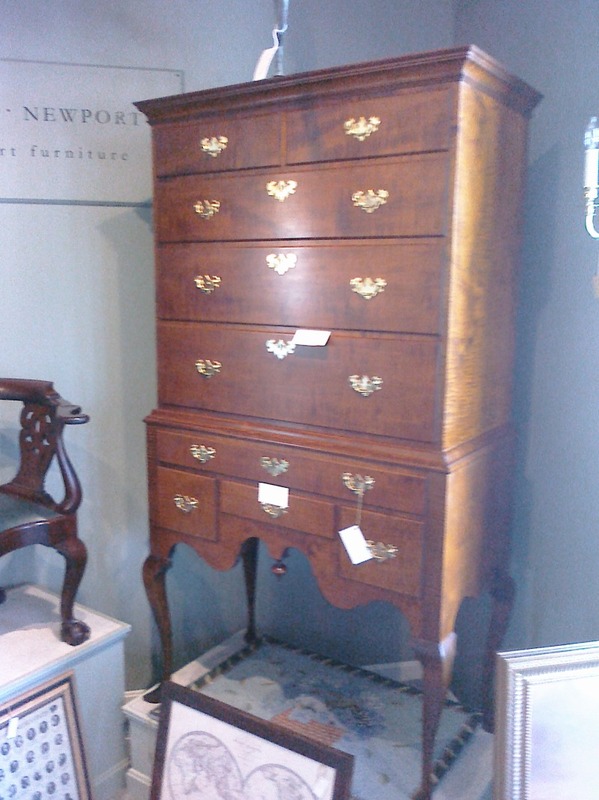 On this piece I only examined the small drawers at the bottom. Similar construction to drawers above except that these drawer bottoms were just flat panels that were nailed onto the bottoms of the drawers. I believe this is an earlier piece – hence the more rudamentary drawer construction, but that is complete conjecture on my part. I also took a look at a beautiful table. 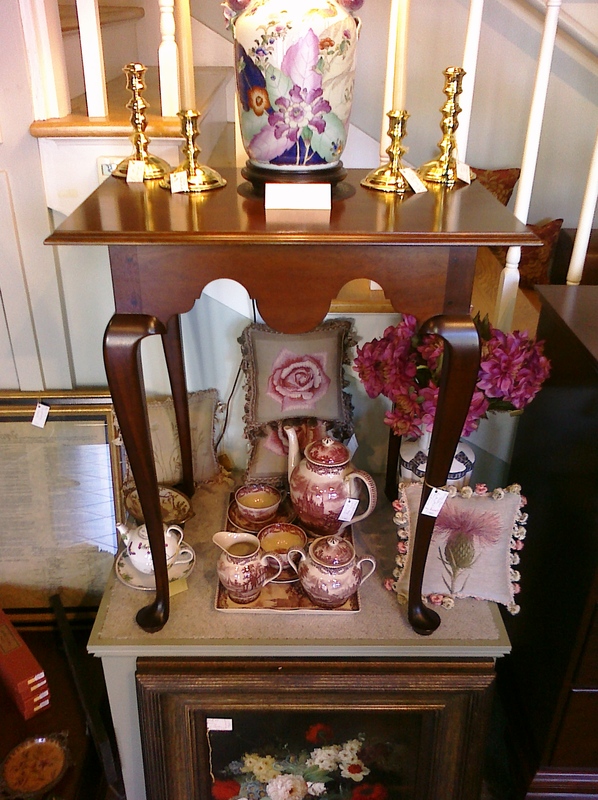 I particularly liked the proportions of this table and the exquisite Queen Anne cabriole legs. I have to thank the shop attendant for letting me remove drawers and take pictures of the pieces so I could share Jeff’s wonderful work with you all. The Breakers is an amazing place. Pure opulence. What amazed me most was that the entire thing was built in less than two years! It’s definitely not my style but it was still very interesting and I look forward to going back to tour more of the Mansions at a later date. Next Post Handplane or Sand before finishing?